Our full range of reproduction bureaus are manufactured to the same high standard as the rest of our furniture. All bureaus come with gold embossed leather insert on the lockable drop down writing flap and incorporate sliding flap supports. 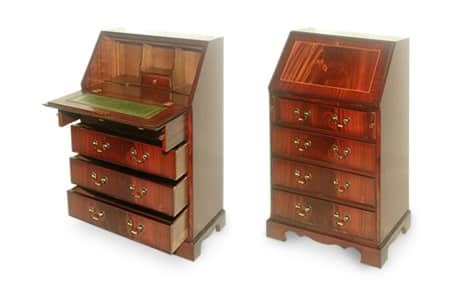 The two smaller size bureaus contain one inner pigeonhole with drawer and the three larger size bureaus come with two pigeonholes with drawers. 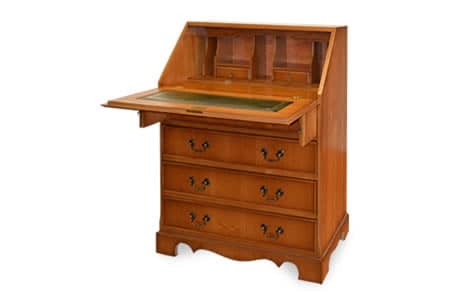 The full bureau range can be made in Mahogany, Yew, Light Oak, Medium Oak and Dark Oak. 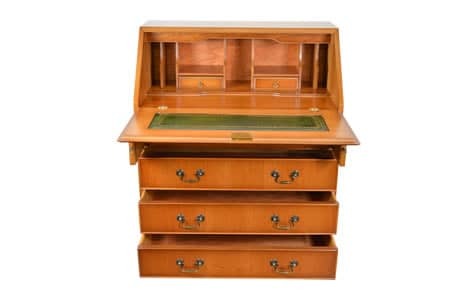 All 4 drawer bureau can also be supplied with one top drawer and lower cupboard. The largest bureau comes with two side by side top drawers and lower cupboard.